In today’s organizational sphere, the use of cloud environments has become more of a necessity. With more and more features and functionality of a cloud environment coming into this market, organizations are provided higher chances for the cloud environment to bear fruitful results in the coming days. There are three main cloud environments deployment options (shared, public & private); however, only the hybrid cloud infrastructure provides one such platform which combines it all. In simple terms, a Hybrid cloud is a cloud computing strategy where users combine different cloud environments connected to each other. These cloud environments can be public or private clouds or simply virtualized infrastructures. Hybrid clouds are designed to operate independently and all data shared across the communication channels are highly encrypted. Today, we will discuss how a Hybrid Cloud Strategy can benefit your organization and what shortcomings can it face. So without further ado, let’s delve in. One may identify various benefits for deploying the Hybrid Cloud within its respective organization; however, we can’t cover them all so here are some of the leading benefits. 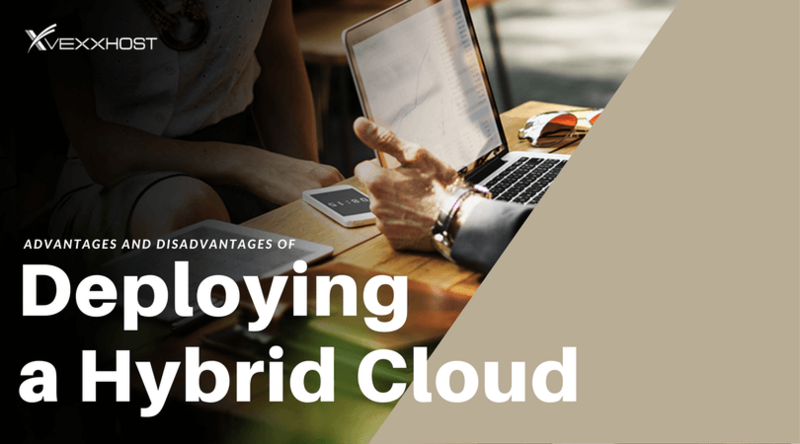 With hybrid cloud, the organization’s workload is contained within a private cloud while retaining the ability to spontaneously increase their workload and perform the spikes of usage on the public cloud. Hybrid cloud has the benefit of being cost effective as organizations pay for the public cloud portion of their infrastructure only when it is needed. With hybrid cloud, organization’s workloads get on-premise computational efficiency which ensures maximum workload management. You also get highly scalable and flexible designed servers which you can use for yourself and even offer it to a number of individuals so they can also make use of it. One of the leading benefits of a hybrid cloud is that you get a centralized private infrastructure on premises. Hybrid Cloud may have a high number of advantages and although it’s one of the most stable cloud environments, it can still portray a few challenges. These challenges should not be left unattended. Although the long-term cost savings are one of the many benefits, the initial deploying cost of a hybrid cloud exceeds as compared to the setup cost incurred in case of a public cloud. While creating a hybrid cloud environment, specific hardware is required to deploy on premises, and that’s what shaves off a large chunk of the budget. Hybrid clouds are indeed secure. But it is necessary that precautionary steps are taken by expert IT specialists to ensure the maximum security of data. Some organizations don’t prefer to store data at an off-site location, and that will evidently make the hybrid cloud environment inaccessible to public clouds. If not picked correctly, cloud compatibility can become a real nuisance for Hybrid Cloud environments. A fast performing on-premise infrastructure may not be able to successfully perform in coherence with a slow performing public infrastructure resulting in a sluggish performance of the Hybrid Cloud. While these concerns are important to address, if catered in controlled environments, utilizing appropriate experts, and resources, a hybrid cloud can become a total win for your organization. One of the robust steps towards making your business a future-proof success story is including the hybrid cloud strategy as a part of the IT infrastructure. One of the leading reasons for introducing hybrid cloud environment within your organization is that it provides you with the liberty to use cloud resources and test new capabilities in-house in a more performance-oriented environment. Also, a Hybrid cloud saves you the hassles of making high investments up-front. To learn more about VEXXHOST hybrid cloud, visite our hybrid cloud page or request a free trial below.